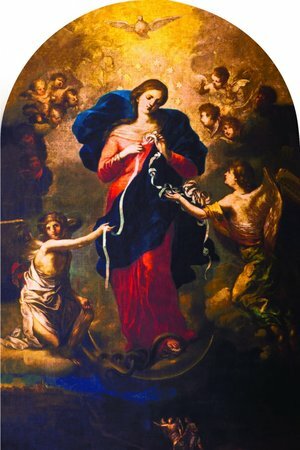 Here’s Day 4 of The Our Lady, Undoer of Knots Novena! Dear Mother, please untie these harmful knots between myself, my brother and his wife and my sister. I also ask that you untie the knots between between my estranged friends and I.
I have wronged many people and myself. Blessed Mother Mary, please untie the knot of estrangement between my daughter and me. Please bring us reconciliation and healing and forgiveness and love…and restoration..And healthy minds and hearts. ❤️ Thank you. Pre-Calculus test tommorow and Friday! Dear mother Mary please help me with this small request. I also pray that I may be able to find my Mary medal that I lost. Mother Mary please pray for my unhappiness and emptiness at work. I ask your son Jesus to shine Mercy and Grace on me that fairness and justice be granted to me. Praise n Thank in Jesus name !? Dear Mother Mary, I ask that you intercede and undo the knots in my marriage. Please remove the hurt, pain, verbal abuse and reconcile our marriage that will give GLORY to our risen Lord, Jesus Christ! Mary Mother of God, pray for forgiveness and reconciliation between my mother and grandmother. May my mother accept Christ and forgive my grandma for whatever she did to her. I also ask Mother Mary to pray for me to our God for a career growth, that God heals my father in law from cancer and to have peace, fidelity and faithfulness in our marriages. that my husband may view me as his friend, mother of his children and his wife. May i also be able to read hard and understand well the course that i have started,and pass exams well . MOTHER MARY PLEASE MAKE ME ALRIGHT .MAKE MY MOTHER VIVIENNE STRONG,MY COUSIN IS APEARING FOR HER FINAL EXAM ON FRIDAY PLEASE LET GET WONDERFULL RESULTS ,AMEN. Please pray that I have the strength to beome healthy and strong and lose the weight I need to do so. I pray for the courage and strength to face my challeges physically and mentally. I especially pray for my 18 year old son with a learning disability. May he find a career path that will make him happy and content. I pray he can make a good living to support himself and a family someday. I pray he keeps a positive attitude and continues to give his all in whatever career he choose. I pray he is open to help and advice. Most of all I pray that all my children keep God as the center of their life and celebrate him every day. This is such an appropriate novena for everyone. Poem based on Novena to Unlock..
Dear Mary, please put your mother’s hands on Liz. Please heal her body from cancer, pain and illness. Please heal her family from the knots that have arisen over the years, so that they may have peace. Amen. Mary the undoer of knots intercede for my family at Tapion, that the knot that is preventing them from being together will be broKen from now and they will bind together as one body. In Jesus’s name I pray Amen. Blessed Mother I pray for my family! Untie the knots and guide me to know how to discuss the problems within our family in a way that is more helpful and more respectful. Show me how to listen and the right things to say in response to the ongoing problems within our family! I ask for your help Blessed Mother! Show me the way! Mary under of knotsb please undo the knots that is tieing up my finances. Please release my finances so I could meet my financial obligations . Mother Mary praying for my family’s health to improve…..Pray for friends intentions…..Praying for John Paul & Annie in their intentions……Pray for world peace…Thanking Our Lady that J’s medical report is good ….. Most gracious Mary Mother of Jesus please pray that I can get my Assistance renewed without problematic issues. My wife and I are desperate for this assistance. Oh, Holy Mother our financial position at this point in time is dire and we need your help and prayers to get us through these troubled times. Help me to change my attitude within our family so that we all move forward. Please help my wife and I mend the mistrust in our family, we need especially at this time of aging to live as a united family. Thank You oh Precious Mother of Jesus. Holy Mother help me in trying to make my husband happier as he struggles with his memory loss. Help me to get through today with the church trip. In the name of the Father. Amen. For dsprengel who has been having a lot of hip pain and had hip replacement surgery today. For mbarry715 and daughter, that all outcomes from doctor appointments are favorable. For teddie69 who has just found out that he has a tumor in his forearm that is eating at the bone. Holy Lady, Mother, undoer of knots, I offer my prayers and intentions for these people, that you may “undo the knots” of pain, uncertainty, fear, and illness in their lives. Please pray for me. I will be going in for a biopsy tomorrow morning, Wed April 25th. Praying for negative results and peace of mind for me and my family. Thank you.